This Sticky Buns flavored coffee is perfect for pastry lovers who wish they could indulge in the sweet and fresh pastry taste while also enjoying their morning cup of coffee. With a melt-in-your-mouth taste, this 2 calorie cup of coffee features buttery undertones mixed with cinnamon, honey, apples, vanilla, raisins, and of course, brown sugar. Made with 100% authentic Arabica beans, this Sticky Buns flavored coffee is a collaboration of flavor that creates the ultimate gourmet coffee experience. Let the deliciously sweet smell of fresh, hot pastries wash over you thanks to this Sticky Buns aroma! Roasted and shipped on the same day, the Sticky Buns flavored coffee will awaken your senses with an added sweetness to your early morning cup of coffee. 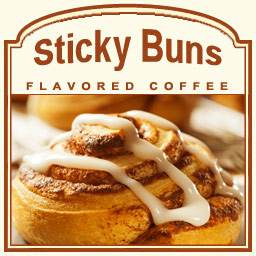 Packaged in a heat-sealed valve bag, this Sticky Buns flavored coffee will feature the freshest flavors with each brew. Go ahead and indulge in your favorite pastry flavors with this Sticky Buns coffee treat!